My inspiration to start a food blog came, in part, from fellow Tampa foodies. The local foodies are a neat bunch and I'm so glad to be among their ranks, with the chance to learn from them and chat about our common interest. A favorite of mine is Tracy from My Other City By The Bay and since discovering her blog, I've been a faithful reader and participator in her posts and giveaways, and have gotten to know her as a friend as well! About a year and a half ago, I won a giveaway of Tracy's for a gift card to Pinkberry and we set up a day to meet at Eats! so I can get my prize. And so my love affair with Pinkberry and Eats! began. Since then, I've dined at Eats! multiple times and recently, Tracy hosted a #GetYourEatsOn Tweet Up and we tried a number of items I hadn't had yet. Additionally, Eats! and Tracy have been gracious enough to supply me with one gift certificate for $50, good towards anything at Eats! (entry form is at the bottom of this post). 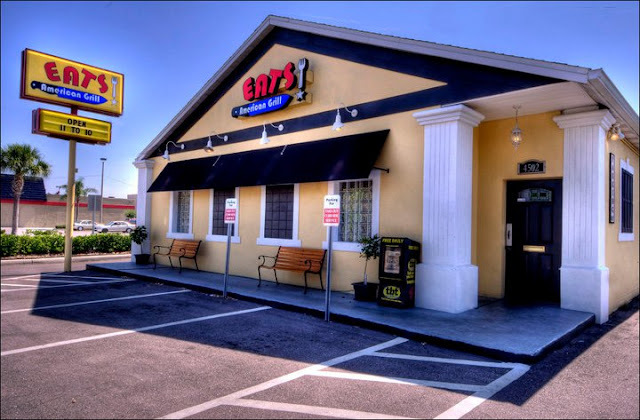 Eats!, located on South Dale Mabry by Gandy, features classic American cuisine from different areas of the country, and I was so excited to come in, mingle, and eat some fabulous food! First, we sampled some sandwiches and burgers to prepare us for featured items during football season. We tried the Pepper Jack/Jalapeno Burger, Classic Black & Blue Burger, Midwest BLT, French Dip and Philly Cheese Steak. 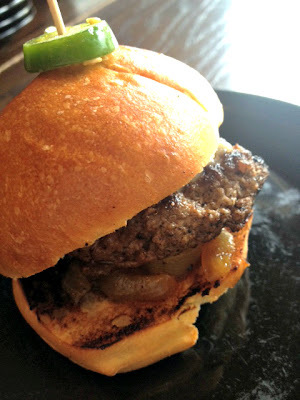 The Jalapeno Burger, with grilled onions and jalapenos cooked into the meat, was so good! Juicy and perfect, I'd order this again. The Midwest BLT is an Eats! classic and an absolute favorite of mine! At the suggestion of Tracy, it was one of the first dishes I ever tried at Eats! and I've ordered it consistently ever since. 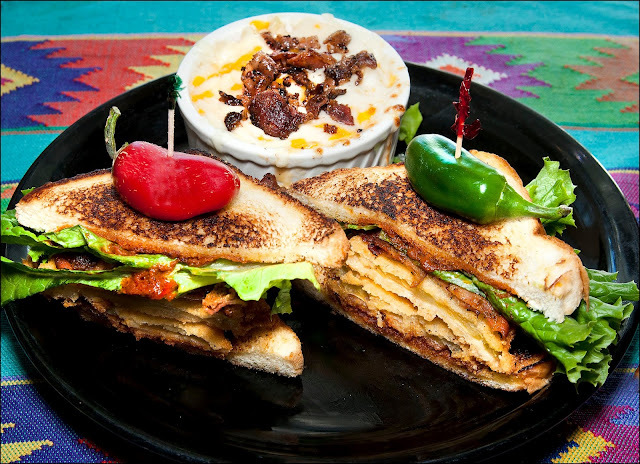 The Midwest BLT is served on Texas Toast and topped with two fried green tomatoes, peppered bacon, lettuce and then topped with their own Signature Spicy sauce. At this particular visit, I tried the Heat sauce. The Heat sauce is so spicy, but adds incredible flavor! In fact, Eats! was featured on the Food Network show "Heat Seekers" for this sauce; hosts Aaron Sanchez and Roger Mooking were definitely impressed. The BLT was also served with a side of Macaroni and Cheese, a delectable side that should be ordered every visit! 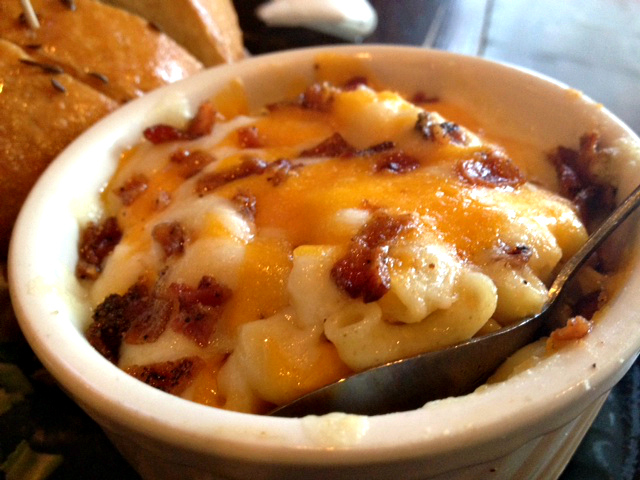 The Macaroni and Cheese is made with different cheeses and peppered bacon pieces and everyone knows that you can't go wrong with bacon. The next sandwich we had was the French Dip. 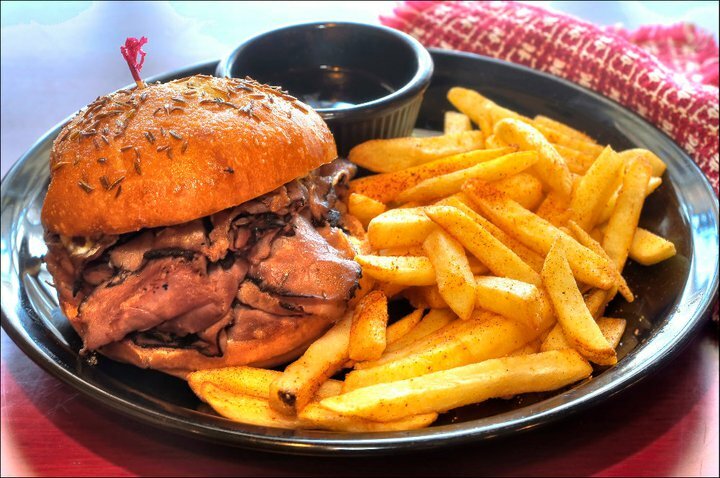 Made with seasoned roast beef, topped with Swiss cheese, Eats! serves this sandwich with a fantastic side of Au Jus for dipping. Everything is right with this one. When I was a kid, I enjoyed Cheez Wiz on crackers all day, every day. It's been about two decades since, but when I saw Cheez Wiz as a topping on the Philly Cheese Steak sandwich, I was intrigued (and excited). 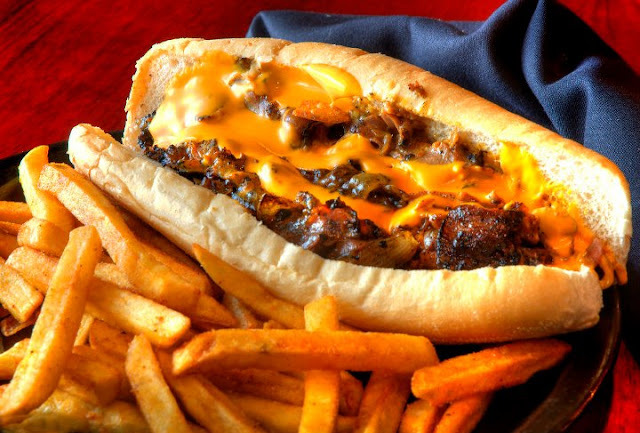 On this sandwich, the shaved Rib-Eye is seasoned with US Soil and topped with the Cheez Wiz Cheese spread and sauteed onions, on an Amoroso roll...and it's every bit as great as I thought it'd be. I didn't get a picture of the Black & Blue Burger- it was devoured too fast- but it's my favorite item on the menu. 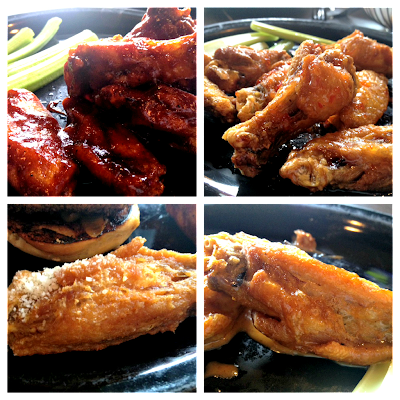 Clockwise from left, we have the Cajun BBQ, Sweet Thai, Garlic Parm, and Spicy Chipotle. All of the wings were great, but my favorite was the Spicy Chipotle. Lastly, Eats! 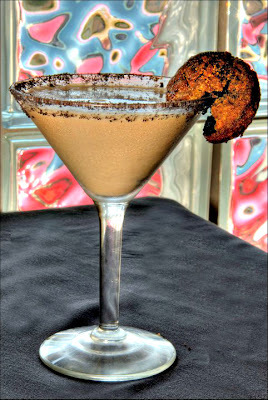 gave us each a Fried Oreo Martini. It's a chocolate martini with a rim of cookie crumbs and garnished with a deep fried Oreo. Delicious and strong, just like I like my cocktails, this martini was a treat! Eats! 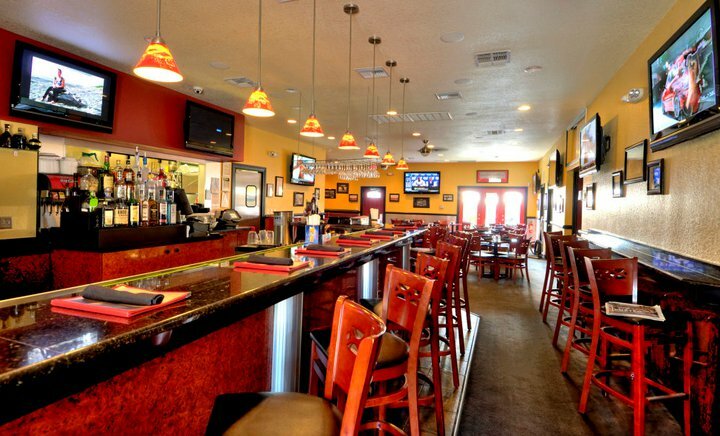 is a perfect place to either enjoy happy hour (daily from 11am-7pm...you read that right), take in your favorite sports game on one of the many HD TVs and/or take the family for a dinner out. With an atmosphere for everyone and every occasion, Eats! can, and should, be enjoyed by all! And!, as I mentioned, Eats! is offering a $50 gift certificate to one reader of mine. Enter using Rafflecopter below (***IF YOU DO NOT SEE THE GIVEAWAY, MAKE SURE TO CLICK "READ BELOW" UNDER MY SIGNATURE***). You have a total of 9 potential entries. This giveaway will run until Tuesday night, September 18th, and the winners will be announced on Wednesday, September 19th. If you have any questions regarding Rafflecopter or this giveaway, please email me at jensfood@yahoo.com. would love to try... the midwest BLT! I love that place...my favorite is the mac n cheese with a build your own burger. Mine would have jalepenos Bacon blue cheese. I'd also buy my 2 boys the fried oreo Sunday! Never been to Eats but that french dip in the pic looks amazing! I normally order their specials. I have also tried the philly cheesesteak...yum. Next time though that Midwest BLT is mine!! Yummy yummy get in my tummy!!! Simply the best! After you submit it, we may contact you to verify your claim. Check your spam email folder if your claim hasn't gone through in a day or two. You'll also find some interesting badges and widgets on your Urbanspoon blog page - look in the right sidebar. If you have any questions, please contact me via email. In a nutshell, I love food. I love cooking and gathering recipes. I love trying new restaurants and making them a favorite. I enjoy family dinners and my favorite part of any holiday is the meal. Recent reviews by Jennifer B.